Moving QUICKLY from that last post...PHEW! Let's talk about stuff that is way more uplifting and FUN! Haha. As you probably know NOW, hahaha...I kind of love reading the more personal blogs. Sure sure, it's nice to see a recipe or a simple DIY, but when one of my favorite blogs posts something even remotely personal, I get all giddy. It's like I'm eavesdropping on something I shouldn't...but I should...because they chose to post it. To me, I love to see where my favorite bloggeristas live, especially inside their homes...I love seeing their kiddies...parties given, date nights...or gifts given or received. It makes them more...human I guess. Like, "Hey yeah! You're actually real! You do real things!" So if you're on my blog lovin list, show your home! I want to see what sheets you sleep on, and your messy closet and....actually...scratch those things. I'm turning into creepster big time right now. But I do want to see into your life- as much as you'll choose to share. I like to see the real side of people. I don't know...does that make me weird? That's why I usually try to do some personal posts from time to time. Sometimes I do really personal ones. I assume that if you're a regular follower of Sweet Lavender Bake Shoppe, then you're a lot like me- and you will also appreciate little insights. 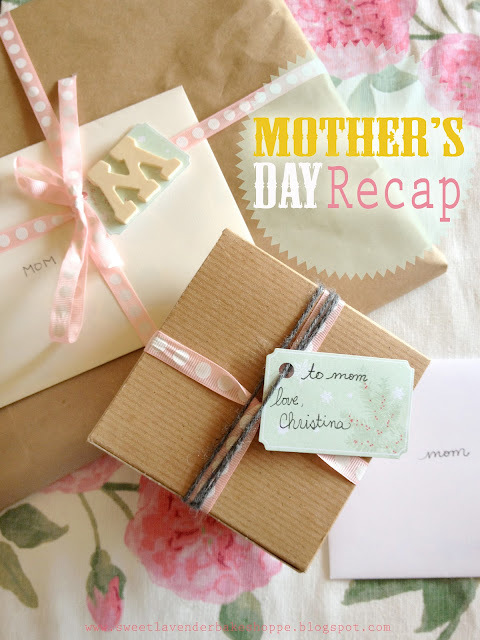 As you probably know, I posted a blog right after Mother's Day on a special strawberry rhubarb crisp that I made for my mama. Wasn't very personal, if you ask me. It was a pretty straight forward recipe type blog...with some pretty pictures. Which is great, don't get me wrong! But I wanted to also show you a little more: what my husband and I both made for our moms, the AWESOME cards we found, and how we packaged them all up (late one night, sprawled on the floor, with cats in EVERYTHING). First off, yes I'm still crocheting. I know I haven't posted very much about what I've made (and YES I have made some things) but that's because 1. I'm EXTREMELY slow at crocheting and 2. a lot of what I'm currently making are gifts...to people who read this here blog. Sorry. It was a no brainer that I wanted to crochet something for my mom for Mother's Day. I kind of nonchalantly asked her one day what she'd like "IF" I ever made her something...and she replied with "Some new coasters would be nice"...HAHA! Perfect! Easy! Fun! I got this! These were SO HARD TO DO! I know there's some super awesome crocheters out there reading this laughing- "A circle?! Really??? That was hard?!?!?!" YES IT WAS. And I kid not- I started and restarted about 4 or 5 times. Each restart getting more and more frustrated! At one point I could have thrown them out the window. ...and I seriously thought about it. I just could not follow the darn instructions on how to make these. I hated these things so much. But then, my mother-in-law came to the rescue. Being one who's crocheted for almost her whole life, I knew she could help me figure out what the heck I'm doing wrong. I brought my book, hooks, and yarn over to her house for one last attempt. She read the instructions and low and behold, "This is written wrong. This should be after this part, and this part shouldn't be until all the way over here. I'm sorry you had such a hard time, I can see why- it's poorly written." If you fancy yourself an avid crocheter, one that is so well versed in crocheting that you decide to write an "easy" crocheting book (or any book for that matter) PLEASE OH PLEASE will you make sure your instructions are correct? BECAUSE IF YOU DON'T PEOPLE LIKE ME WILL HATE THE VERY THING THAT IS CROCHETING! Speaking of my mother-in-law, this is what her lovely and extremely talented son made her! CUTE RIGHT!? AMAZING RIGHT?!? Ahhh I just love it. Yes there were tears...a lot of tears actually. He was going for tears from his mom for sure, but had no idea he'd get some from his aunt and grandmother as well. It was beautiful actually. We're all very much a family that loves their little furry friends. If you know someone who would love something like this, you're more than welcome to purchase one here. All he needs is some time and a few lovely pictures of the little guy (or gal). 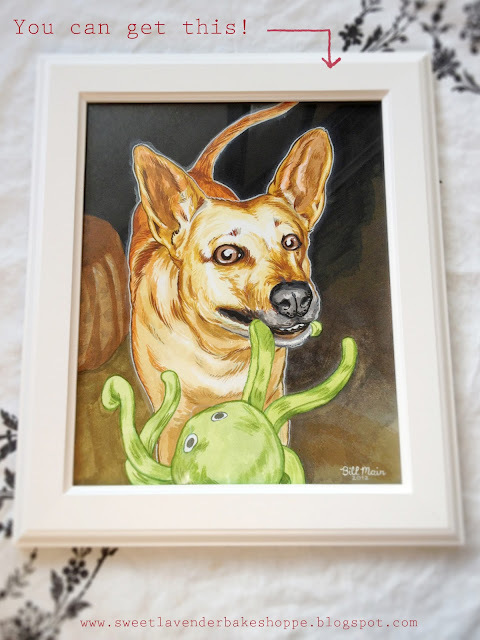 Custom watercolor pet portraits? I think yes! You can get this card here! And now the cards!!! Oh these cards! I am in love with our Mother's Day cards! Being a teeny tiny business ourselves, we like to buy gifts and such from other small businesses. We know how hard it is to make a living doing what you love doing, so we love to help support those types of guys whenever we can. Sure Target has a brand new card section...and sure it would be easy to go and get one of those. But why? Why, when you can find such neater (and more unique) artsy cards on Etsy...and sometimes cheaper! So, shown above is the card Bill chose for his mom...and down below is the one I purchased for mine ;) Please check those stores out! They're great! Please please get this card here! We chose to simply package them up. We always have some Trader Joe's grocery bags on hand for this very reason- great (and free) gift wrap! All you have to do is cut the bag to make it flat, flip it over and wrap making sure the blank kraft paper side is what's showing! It provides the best blank canvas for easy and personal gift wrap! Then we tied our packages in some simple soft pink and white polka dot ribbon. Bill made an easy gift tag out of left over gift paper, glued with a wooden "M" for mom. I took some contrasting darker yarn and wrapped around my tiny box. Then adorned with the same left over gift tag thing-a-ma-bob. Easy peasy right? You can totally do it! Oh yeah, then there was this crisp I made as well. I felt like if I were to just show up with coasters it wouldn't really work...and my family kind of figures I'll always come with dessert now- so this was perfect. Because I haven't yet said it- Happy Mother's Day to all of you Mother's out there! I know it's late, but that's ok. To ALL my 2,354,756,467 friends who are either pregnant, with child, or with many children- SUPER Happy Mother's Day to you!!! I like all your posts but I like the ones that are packed full of goodies! I want to comment on everything! First off, I don't know if right now you want to see our home. We are in the process of selling our house and keeping it toddler proofed. So it is ultra minimalist. No photos out, no pictures on the wall, very little furniture. It's so boring right now. But someday when we move I can't wait to decorate and show the world! You should do a tour of your house. I bet I would spy a million things and say, I have that, or LOVE! I want that!! I can be a creeper too! Awesome crocheting! The coasters are so pretty! Love Bill's drawing! How sweet. I still need to have him do a picture of my ol' sweet kitty. Lovely wrapping & trimmings! Your mom was spoiled! Happy belated Mother's Day to you. My philosophy is, you don't have to be someone's mother to be celebrated. You are kind, thoughtful, nurturing and loving... All very wonderful mothering traits! "End of novel comment part deux :)" This made me laugh, snort, and scare Mombi girl. All of this is great! I especially love the dog picture and the cards! But yeah, this is true- I think it comes in waves. The beginning of last year I swear we found out 10 or 11 people were pregnant! Then it slowed down. But it has started back up again the last few months- I think we're on person # 3 or 4 now! Phew!